Bayern Germany (English name is Bavaria) offers a huge scenic diversity. It is also known as the free state (Freistaat) Bayern. Discover the thriving capital Munich, medieval towns, famous castles, rolling hills and the impressive alpine scenery. Visitors can experience a wide range of leisure activities, sports and join all kind of festivals. No wonder that Bavaria is a favourite tourist destination, for Germans and travellers from all around the world. Enjoy the pictures while you browse this page. Bavaria, located in the south-east of Germany, is the largest German state. It is well-known for Neuschwanstein castle and the Romantic Road. However, let me tell you that Bavaria has much more to offer for your unforgettable holidays. What do you want to know about Bayern in Germany? Please use the quick links to jump to an area of interest. Geography: Low mountain ranges in the north and east, the Swabian and Franconian Alb in the west, the foothills of the Alps (Alpenvorland) and finally, the alpine mountains in the south. Rivers - The largest river is the Danube (Donau) in the south, and the Main, which meanders through Franconia in the north. People and regions in Bavaria belong to three cultural tribes: Bavarians, Franconians and Swabians. Altbayern (Old Bavaria), the name-giver of the state, consists of the three districts Upper Palatinate, Upper and Lower Bavaria. It is here where you can hear the real Bavarian language. 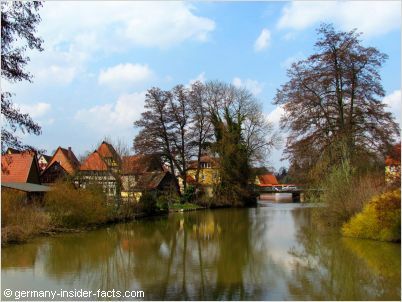 Bayern was a kingdom until 1918, ruled by the dynasty of the Wittelsbacher since the 12th century. Franconian and Bavarian-Swabian territories, including their different dialects and traditions, became only part of Bavaria in the early 19th century. Bavarians feel they are somewhat different as the rest of the Germans. They tend to call Germans from other states humorously "Preißn", the Bavarian version of Preußen (Prussia). Although not all Germans are Prussians. When the going gets tough you might even hear the word "Saupreiß". This is mainly valid for the "Altbayern, or Old Bavaria" districts. Yes, Bavarians are proud of their history and customs, so are the Franconian and Swabian people. So my very short excursion into history hopefully helps visitors to understand Bayern and its people. You might hear someone in Franken say, we are not Bavarians, we are Franconians. Anyway, you will find a wide range of traditions, dialects and superb food varieties throughout the state. There are 7 administrative regions as you can see on the map further down this page. Each region has its own history, culture, highlights and is definitely worth to visit. The map opens in a new window, so you can refer to it while you discover the highlights of Bavaria. The regions from north to south and their main attractions are as followed. Abbreviation of the German name and the English name in brackets. The river Main, with its large bends, is said to be the heart and soul of Mainfranken. It is a famous wine-growing region. Picturesque towns and vineyards spread along the riverbank. Cyclists enjoy the separate cycling routes along the river, away from the traffic. Discover low mountain ranges like the legendary Spessart and Rhön, a paradise for hikers. Everywhere you'll find beautiful little towns with charm and history. 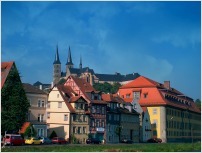 Würzburg with Marienberg fortress, the Residence and the cathedral is best known city among travellers. Miltenberg, Marktbreit, Dettelbach, Mainbernheim and Ostheim vor der Rhön are only a few of the many beautiful towns in Lower Franconia. The red Main and the white Main flow through the east of Oberfranken before they confluence to build the Main south of Kulmbach. 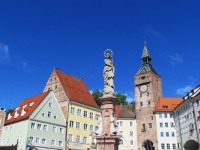 Beautiful nature and lovely towns, history and culture, invite visitors to stay for a while in the northeast of Bavaria. Fichtelgebirge with its highest point Schneeberg is a paradise for hikers and wintersports. The Fränkische Schweiz offers rock formations, caves and castles, as well as castle ruins, it is one of the oldest holiday regions in Germany. Oberfranken is beer country! More than 200 breweries means that you can sample a good beer nearly everywhere. 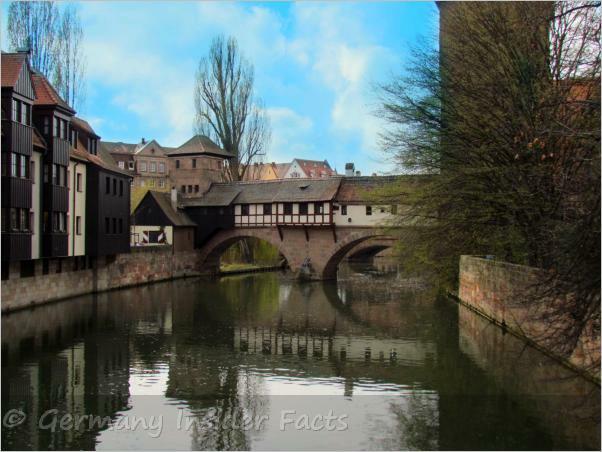 Bayreuth and Bamberg are the largest cities with a long history and stunning sights. 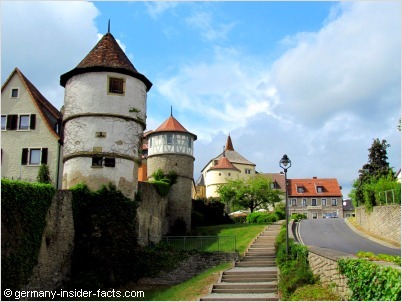 Coburg, Kulmbach, Kronach are a few of many picturesque towns in Upper Franconia. Nürnberg (Nuremberg) is the largest city, followed by Fürth and Erlangen. 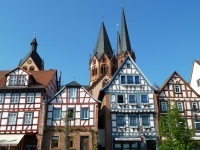 These three cities in the east of Mittelfranken build the main industrial region. Ansbach, further to the west, is the administrative centre. The tourism route "Romantic Road" crosses the east, along the border to Baden-Württemberg, through a lovely rural landscape. Rothenburg ob der Tauber and Dinkelsbühl are the most stunning medieval towns, with fortified towers and gates within their still intact city walls. It is really worthwhile to take your time and stay a few days in Middle Franconia. 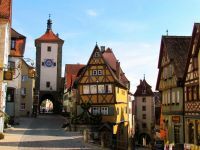 Click here to read more about the Romantic Road, or visit my Rothenburg page. 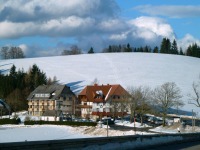 Oberpfalz is the least populated district in Bavaria. The mostly rural landscape features nature parks, low mountain ranges and lakes. The Oberpfälzer Wald is known for its many castles and ruins, which tell the stories of an eventful past. 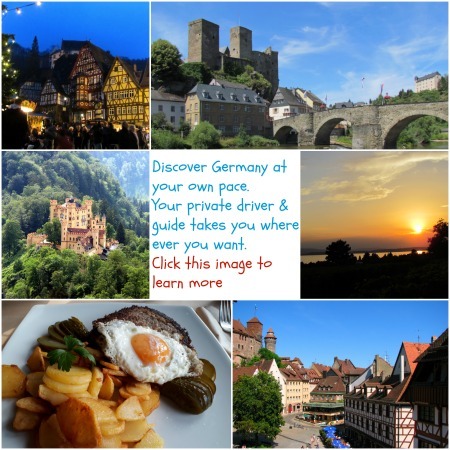 The Upper Palatinate is considered one of the cheapest holiday regions in Germany. Apart from the nature, the historic old towns of Regensburg, Weiden, Amberg and Neumarkt are amongst the main attractions. When you are near Regensburg you shouldn't miss the Walhalla. The hall of fame honours people of the German language from all walks of life, politicians, artists, kings, clerics and scientists. 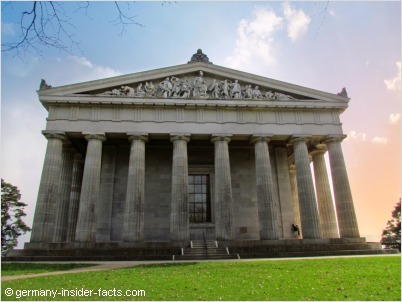 Conceived by Bavarian King Ludwig I, the hall which resembles a Greek temple, was opened in 1842. Walhalla sits on a plateau above the Danube, the views from there are amazing. Duis hendrerit ultrices odio. Nulla hendrerit dolor at enim. Quisque sed tortor. Cras felis ante, semper non, facilisis ac, dignissim porttitor, dui.